Golden Lady have always made some of the best items of leg wear for curvy girls and they continue this great track record with this new microfibre design. This is a 50 denier pair of microfibre tights making it plush and soft as well as cozy enough for all but the harshest winter weather. 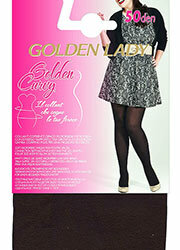 These tights go up to a 56" hip too, making them one of the best items for choice and availability of sizes.